The Palm Springs Art Museum in Palm Desert formally opened to the public March 15, sharing not only a new level of art and culture to the mid- and east valley, but common architectural ties. 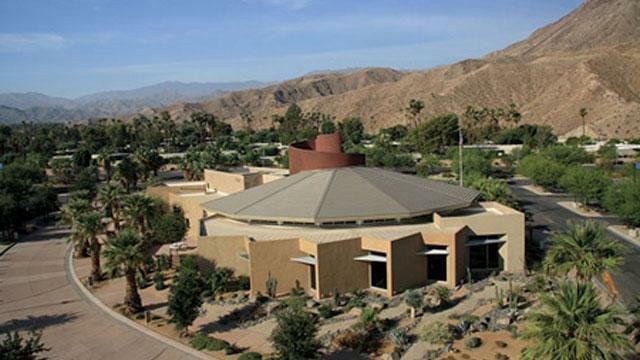 The 8,400 square foot building located at Entrada del Paseo, corner of Highway 111 and El Paseo, was formerly the city visitor’s center, designed by acclaimed desert architect Reuel Young. Built in 2005, Young captures the motifs inherent in Desert Modernism such as its Albert Frey-like sharp winged roof shading an upper terrace and entrance below. From its essentially a circular shape are angled walls that fan out with floor to ceiling glass that offer full views of the outdoors. The building is carefully situated on the site with reference to the sun’s seasonal positions. Windows and doorway are shaded by metal overhangs or, depending on the time of day and season, fall into the shade from the strategically angled walls. Principal of Interactive Design Corporation (IDC), Young’s philosophy is to “create places that support social interaction, foster a sense of belonging, are a memorable background to life, and are beautiful.” His designs take their cue from the context of the site, and the purpose of the building. The building is architecturally significant not only because of its modern design, but was the first new Leadership in Energy and Environmentally Design (LEED) certified building construction in Southern California. It has 60 photovoltaic panels on the roof producing solar power, which reduces the usage of electrical resources. Sustainable materials include cabinetry made from bamboo, wheatgrass, sunflower seeds and sorghum stalks, and high-efficiency fixtures that contribute to water savings, as does the drought-tolerant landscape. The center is now referred to as the Galen, in honor of a $1 million gift from Helene Galen, given in memory of her late husband Louis, a long-time desert resident. It’s situated on four acres of landscaped gardens, called the Faye Sarkowsky Sculpture Garden, created from a $1 million gift from Herman Sarkowsky as a tribute to his wife. The new museum now houses four separate gallery areas for rotating exhibits. The opening exhibition is entitled Rodin to Now: Modern Sculpture with works from important modern sculptors including Auguste Rodin, Henry Moore, Pablo Picasso, Edgar Degas, Alexander Calder and many more. Outside gardens contain sculptures by Donald Judd, Dan Namingha, Jesus Bautista Moroles and others. After you’ve visited the new museum, take a drive to see other Mid Century Modern architectural homes and enclaves in the Palm Desert area, just minutes from the Galen. Down the road on El Paseo is the iconic Sandpiper condominium community, and nestled in the south Palm Desert hillsides off Highway 74.